I suppose I’m not the only one quoting this Scripture at this time of year, but it’s worth quoting again. I love to set goals, if only to keep myself on track; and yet so much of my life is entirely in God’s hands. I can do my part; get up every day, feed the horses, ride my best, look for better ways to train and care for them, strive to become a better horsewoman, a better rider, but ultimately – a better student, a better daughter, a better girlfriend, and a better child of the only Living God. Yet my Lord can flip my whole world on its head with just a flick of His little finger. He did it last year, and it was so much better than it would have been if the year had gone the way I planned it. Thunder has never had a bucking fit in his life, in fact he might be the only horse I know who hasn’t done a proper handstand. He walks, jogs and lopes in the arena without any issues apart from the standard lack of balance of a young horse. 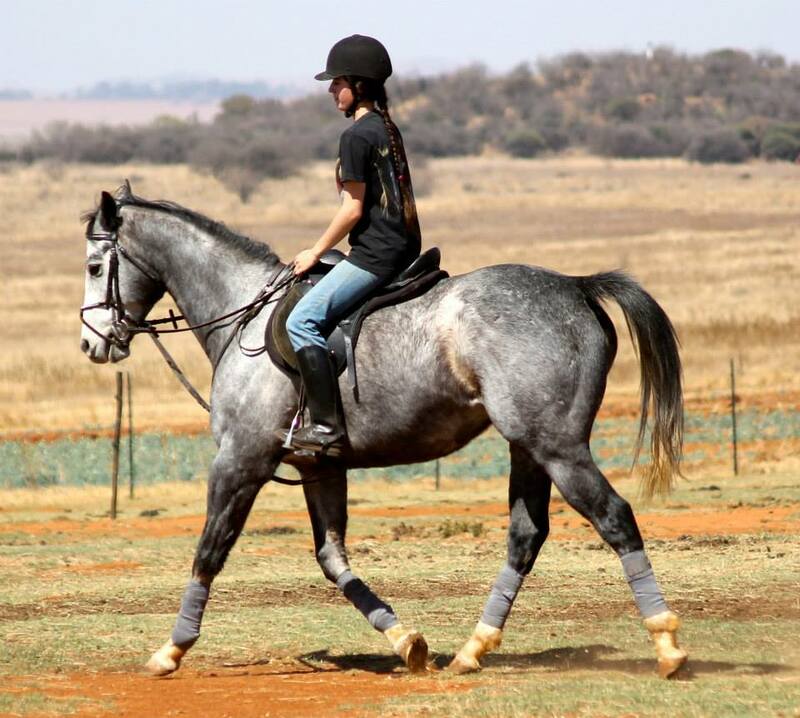 On outrides, he is reasonably reliable; I wouldn’t like to put anyone else on him, but he mostly behaves with me. He doesn’t nap or run home at all, but he can be quite spooky and has bolted once or twice when I was caught unawares. His spooks thankfully never include bucking and he does have brakes, but I don’t like it very much and took my first fall off him the other day (to be fair, an old girth strap snapped, so it wasn’t really Thun’s fault). He canters calmly alone and in company on outrides in any direction, as well. This year, I’d like to spend some time working on Thunder’s physical strength, since he is old enough to handle heavier work now. 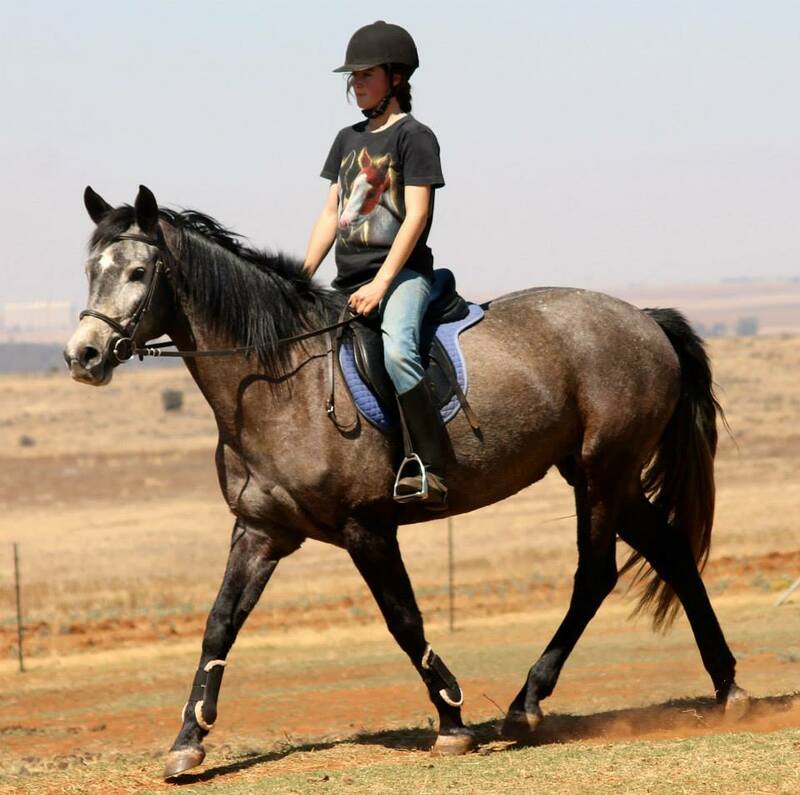 Lungeing in side reins to build his loin muscles in balance, particularly in canter, will help. I would like him to lope slowly and on the correct lead (using simple lead changes for now), understand the basics of neck-reining at all three gaits, learn to stand squarely, and turn on the haunches by the end of the year. Outrides should also still be done at least once a week; I would like him to go out consistently without bolting, alone and in company, by the end of the year. OMW! Arwen’s ears are up! Never mind the terrible frame, Arwen’s ears are up!! Arwen. Arwen also met her goals last year by competing at two events; a Western mounted games clinic (off topic, but loads of fun) and a jumping schooling show. She was wonderful at the jumping show, rounding off her day with a splendid double clear for a fourth place in the 60cm jumping. I would like to get her on the show circuit more regularly and to raise the bar slightly to be jumping around 80cm competitively by the end of the year. I would also like to enter her in a few dressage shows and see how she does, starting with the Preliminary tests, they don’t look that hard. (Ha! Famous last words). At home, she can learn to jump 1.10m consistently (whether she will ever compete at that level or not, I’m not sure, but it’s worth a shot). Her canter, whilst good, needs some work; she must learn flying changes. I want her to improve her frame so that she is going in a good outline with her nose in by the end of the year. She must also learn to do all her lateral movements, which she does well in a walk, in trot (starting with shoulder-in and then travers and half-pass). She must also be able to extend and collect her trot. This will put her at Elementary Medium level. I’ll need a pair of spurs, but to be absolutely honest, I love spurs on advanced horses, they really give a lot more precision. Magical Flight. 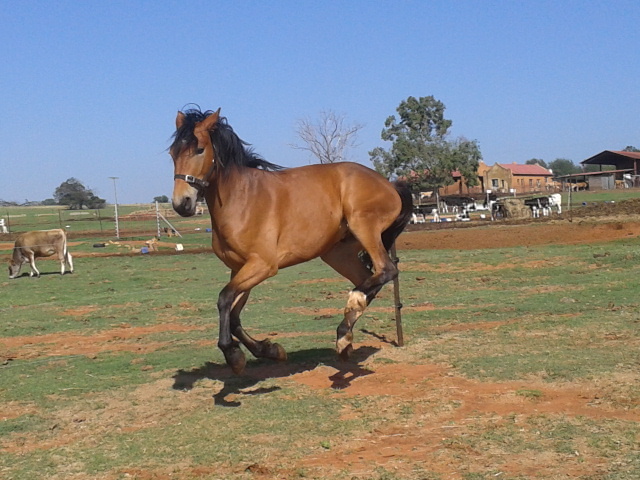 My splendid thoroughbred ended the year by injuring himself, not once, not twice, not even thrice, but four times. Yes, four. First his poor little feets didn’t like the mud and went all sore, then he was mysteriously lame for a week, and just as that cleared up, he cut himself. In case he wasn’t getting enough attention, he then cut himself again, almost to the bone, poor baby. Thankfully, all his injuries but for the last cut are healed. This last cut is a nasty deep one on the inside of his front right cannon bone just below the knee. The vet and Mutterer checked it out and agreed that stitches won’t be necessary, but it’s still a gory business of changing bandages and sticking on a homemade but very effective remedy – a mixture of raw wild honey and proudflesh powder. In a few weeks, handsome boy should be back on track. Magic’s schooling improved in massive leaps last year; by the end of the year he was happy at 90cm, carried himself in a decent frame at all three gaits, led on the correct lead (simple lead changes), and had jumped as high as 1.20m. His muscle tone had also improved, especially bringing out a bit more of a neck and cutting down on that unflattering hay belly. This year, I want him to build even more muscle along his topline and tighten up his tummy. 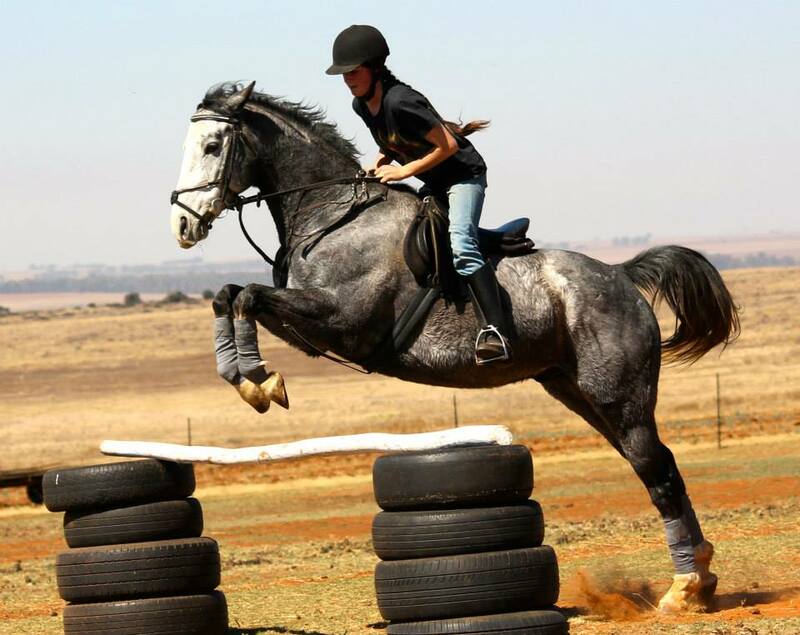 I’d like him to be jumping 1.10m comfortably at home, and also to go to his first jumping schooling shows. His flatwork could do with work – he can still toss his head in the air and rush sometimes. So to wrap it up, this year Magic must go to his first shows, and learn to make calm transitions between gaits, leg-yield in walk, start flying changes, and build correct muscle tone. Cling to mane like beginner! Stare at floor! So pro, right? Yours truly. As a rider, I grew a lot last year, but there’s still plenty room for improvement. In dressage: My leg position is fine right now, much better than the chair seat I used to have; but now I need to work on my arms, hands, shoulders and eyes. From spending ages trying to get Arwen and Magic to bring their noses in and lower their heads, I have developed a habit of nailing my hands to the horse’s shoulders, turning out my pinkies (and hence my elbows), slumping my shoulders and staring at the horse’s mane. Charlotte Dujardin does not do this. I wanna look like Charlotte Dujardin. She is a British dressage heroine and she wears a helmet. Viz., she is amazing. I must get into the habit of riding with a proper upper body: eyes looking between the horse’s ears with chin up, hands a fist’s breadth above and in front of the pommel, thumbs turned up, elbows relaxed by my sides with upper arms hanging almost straight. In jumping: My position always looks super weird to me on photos; I think I’m nailing my hands to the poor nag’s shoulders again. 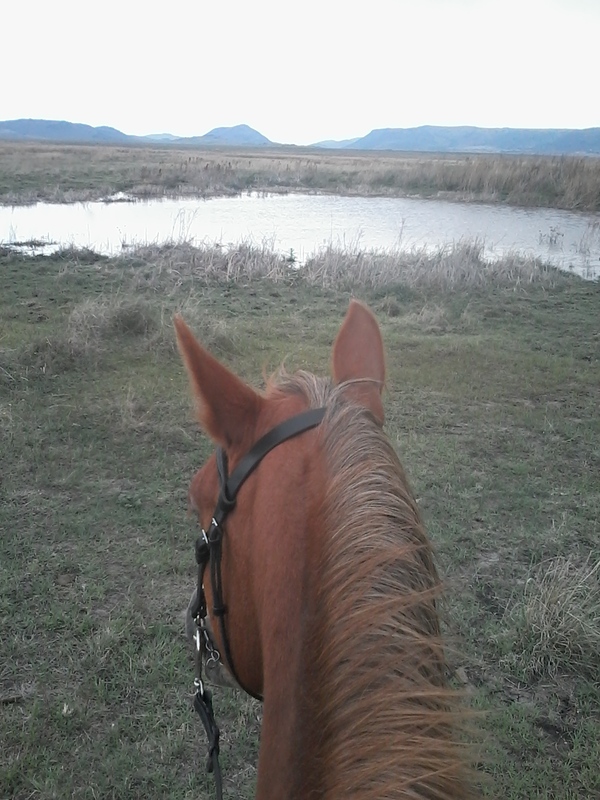 I must learn not to balance on my hands, but to push them forward and allow the horse to stretch. Oh, and I can stop doing that funky poke-one-toe-out thing. And I must ride right up to every jump instead of sitting there going “you better jump by yourself little pony, I’m much too scared to do anything”. In Western: Ha! I don’t even know what a proper Western seat looks like. Fix this. Stop leaning forward and gripping with the knees in lope and halt from lope. So there you have it, readers. Lord willing, this is what I hope to accomplish this year. And everything hangs on those two words: Lord willing. Because His will is pure and right and perfect, and I place everything in His hands.